Petrus Ng, Managing Director, BASF Thailand and responsible for Vietnam, Laos, Myanmar and Cambodia, delivering his opening remarks at the grand opening ceremony of BASF (Cambodia) Co. Ltd..
BASF on Wednesday inaugurated its first wholly-owned company in Cambodia: BASF (Cambodia) Co. Ltd., and will launch three new crop protection products in the country. BASF has been active in the Cambodian market since 2014 through distribution partners. 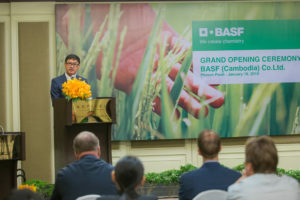 Now, the company’s direct presence in the market will offer potential Cambodian customers and stakeholders innovative solutions in a range of diverse industries, BASF said. To support local farmers, BASF will maintain a team of local technical specialists in Cambodia, who will be supported by BASF’s network of experts in Southeast Asia and around the globe. 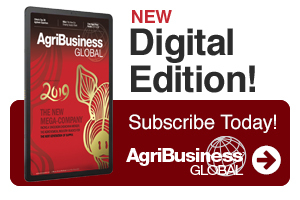 Additionally, BASF aims to engage with both distribution partners and farmers directly to conduct training sessions on sustainable agricultural practices; including proper selection and safe storage, application and disposal of crop protection products.